Second quarter earnings season kicked off (unofficially) last Monday with Alcoa reporting, and that means we're going to be hearing a lot from the largest companies in the US over the next two weeks. While we will get updates on how these businesses are performing, it will also be a chance for executives to explain themselves on conference calls following their earnings. During these calls, companies can explain why they were successful or more likely, complain about all the things that were dragging their results down. In two hours the UK economy has lost $350 BILLION. That’s equivalent to 40 years of EU contributions. 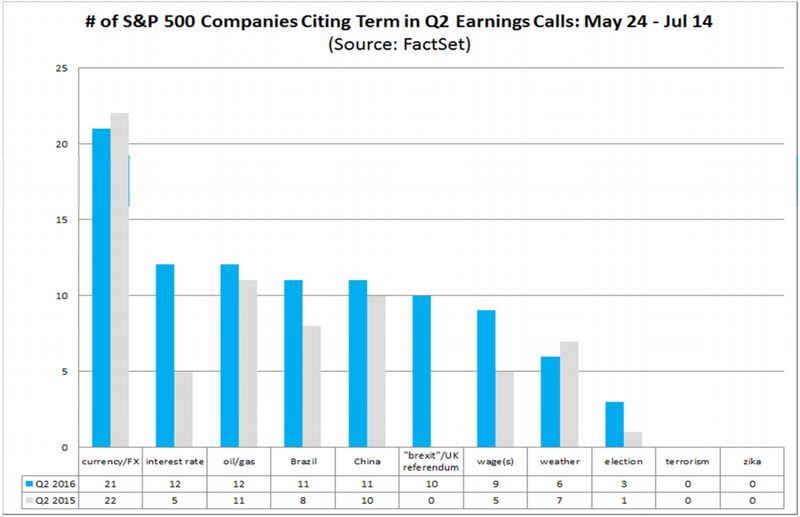 So far, 35 companies in the S&P 500 index have reported earnings for the quarter and they've had a lot to complain about. John Butters of FactSet went through the 30 conference calls of firms that have held them so far and found that the largest complaint, by a mile, was the strong dollar. "Of the terms searched, 'currency' was the term cited in the most conference calls (21) to date," wrote Butters in a note to clients Friday. "The terms 'Brexit' and/or 'UK referendum' were cited by 10 (or one-third) of the S&P 500 companies during their earnings calls." We've previously noted that Brexit, as an excuse for volatile earnings, will most likely crop up a lot this quarter, but even the UK's decision to leave the European Union can't outpace the strong dollar in terms of S&P companies' worries. In fact, companies have listed the impact of foreign exchange as their top concern as far back as April 2015. And given the volatility globally, there's little reason to think this will change anytime soon. Also included in the top five complaints were interest rates, oil and gas prices, Brazil, and China.